I’m teaching Eleanor how to knit mittens on four needles. It’s actually easier than making a plain ol’ scarf — and way more exotic (to her). Who’d like a pair? Eleanor has always been very interested in textile crafts. Last Christmas she made potholders for just about everyone she knew. She’s discovered string games and loves weaving big loops of string around her fingers to make different shapes. Knitting seems like a no-brainer. And we started her off with a little doll-sized scarf about 1 1/2 years ago, but it hasn’t been a hit. Let’s admit it: scarves are boring. 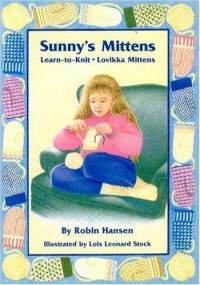 Then I found this book called Sunny’s Mittens on Amazon. It’s a picture book about a girl learning to knit mittens under the tutelage of her Nana. The illustrations are SO 80s and the text is a touch awkward, but it does an excellent job of explaining Swedish “Lovikka” mittens to a child-adult team, explaining what the child can do alone, what tricky bits the experienced knitter should do, and hints for making the knitting easier. I was so excited that I went out and bought some wool yarn (you have to use 100% wool, as you felt the mittens at the end). The only skein the yarn shop had was massive, but it was a good price, so I decided that I’ll make mittens for other kids when Eleanor gets done with hers. 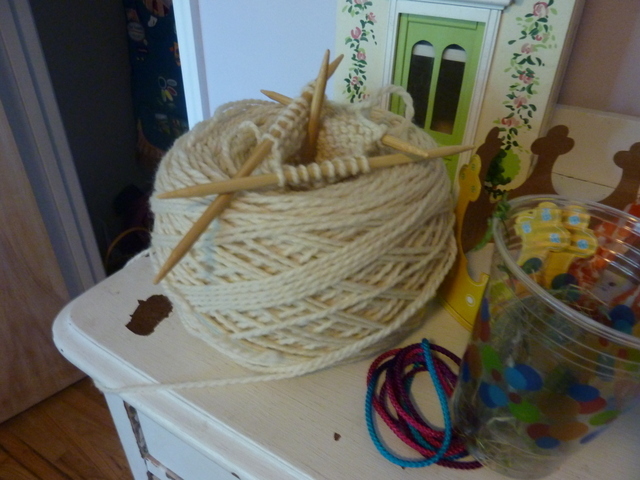 The shopgirl at the yarn shop wound the skein on her machine for me. This is what it looks like . . . Eleanor calls it “The Wheel.” I included the plastic cup for scale. Next Post Hello, Muddah. Hello, Faddah. I missed that status update! Me! Me! That is awesome she is learning how to knit, especially something as tricky sounding as mittens. I’d give up before the first step.